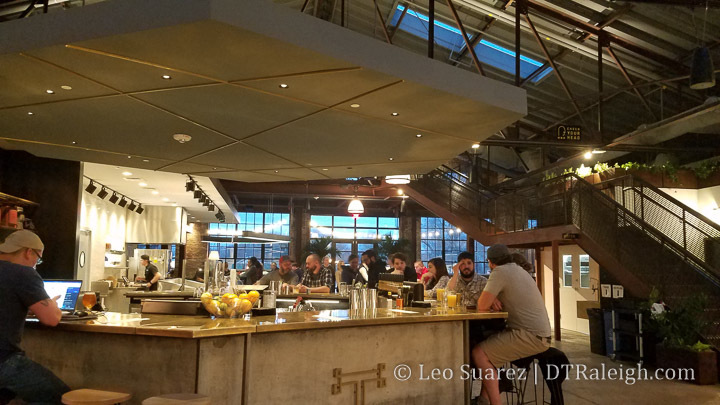 Have you been to Transfer Company Food Hall yet? While not officially open (are they?) the new food and drink vendors over at Transfer Company have been slowly opening and the entire place is operating on a week-to-week basis. What started with empanadas and seafood has now become a weekend draw for tasty eats including bagels, cookies, and beer. Not to mention the space looks great and is enjoyable to be in. There is still plenty of work to be done inside the space but the best way to stay in touch is through their website or Instagram. It’s been fun to watch them grow slowly but the ball is really starting to roll on the east side of downtown. 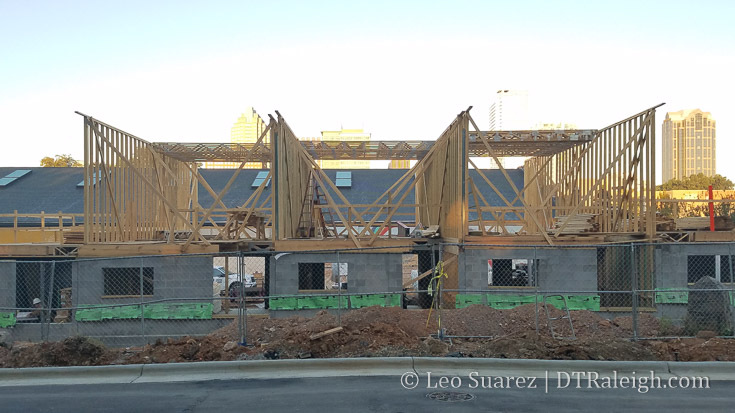 These townhouses along Chavis Way are starting to rise up. 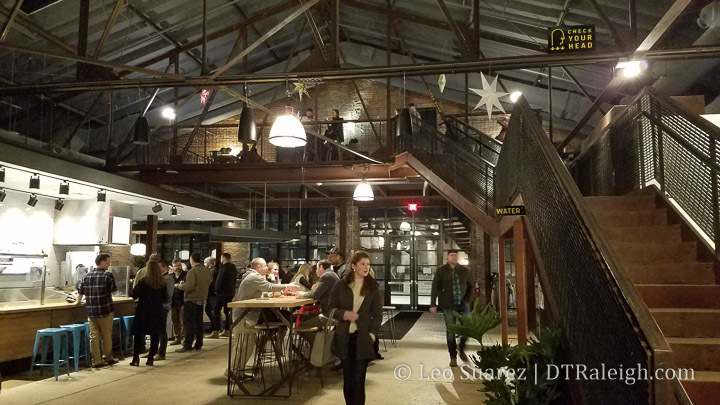 This project, called The Ware, is located next to Transfer Company, a renovation of Stone’s Warehouse into a food hall and grocery. In addition to the photo, I have a surround shot embedded below. This is the corner of Chavis Way and Davie Street. If you are reading through email or RSS, click through to the blog to see it. 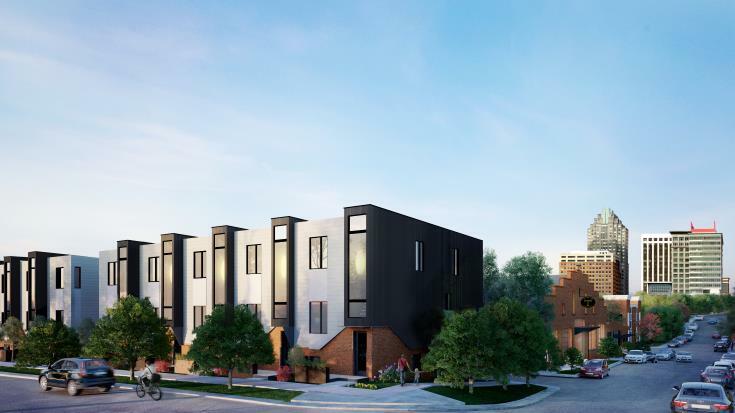 Monarch Properties has announced plans, along with renderings, for their townhome project along Chavis Way. This is right next to all the work taking place at Stone’s Warehouse by Transfer Company. The townhomes were designed by Raleigh architecture firm Clearscapes with front doors along Chavis Way and the greenway. Work on the food hall has really picked up recently and they are landing some very promising tenants including Boulted, Jubala, Videri Chocolate, Saxapahaw General Store, Centro, and Gallo Pelon. Demolition is taking place at Stone’s Warehouse. The project is moving along now as the former Rex Senior Center is coming down and new art projects line Davie Street. Banners on the front of the warehouse tease a 2018 opening. Plans are surfacing a bit on the future of Stone’s Warehouse, the former bus repair facility and senior health care center located at 500 East Davie Street. The future mixed-use site will include retail across both the existing warehouse building and a new construction building. 15 townhomes will also be built on the site. 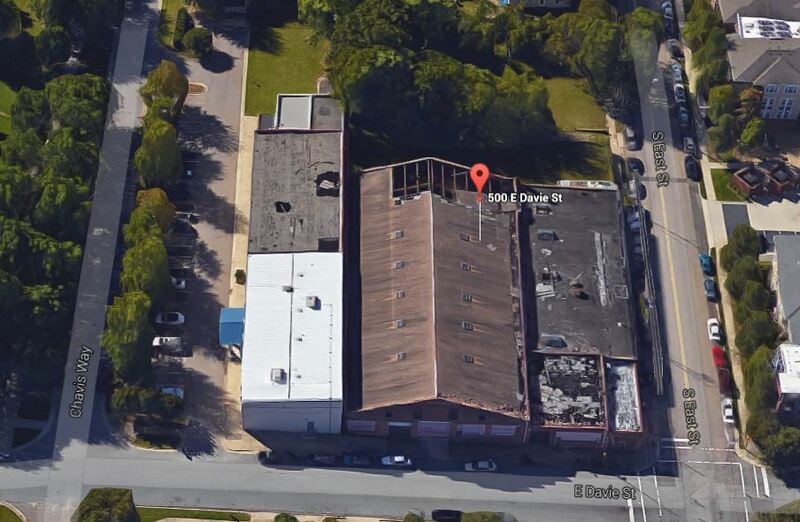 If not familiar with the site, pan around it here on Google maps to see Stone’s Warehouse and the former Rex Senior Health Care Center buildings. The warehouse will be renovated while the white building where the health center once was, will be removed. To the south, the open area will contain a public plaza and new building for additional retail space. The pedestrian access will physically and visually connect Chavis Way and the adjacent greenway to the plaza amenity and through to East Street through a series of cross-access agreements, effectively segmenting the parking where an island would normally be located. The plaza will be open to the public as well as tenants and is supported as an approporiate use of an urban open space for a mixed-use proprty by City of Raleigh through their RFP process. Trees that are currently at the site will be moved to align with this plan, as shown in the sketch below. Pedestrian Cross-access planned for Stone’s Warehouse. Click for larger. The 15 townhomes will line Chavis Way, built in sets of five resulting in three separate groups of units. The plans appear to show garages for the townhomes so residents won’t have to compete for parking. 52 parking spaces will be included as well to support the retail buildings. This is a great, unique project in a transitional area. Residents in the core should have an easy time walking to the site while those in neighborhoods should not have difficulty getting here by bike or car. It’ll be great to watch the renovation take place. At this week’s city council meeting, progress was made to two very interesting projects. The overhaul of Market and Exchange Plazas was approved and money will be spent to start construction. 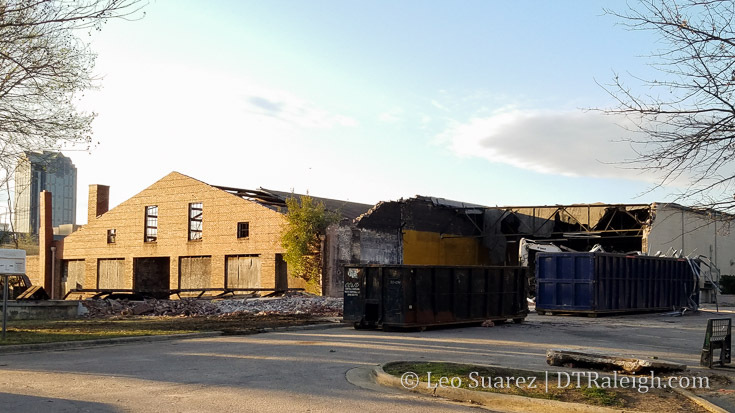 The city owned Stone’s Warehouse and nearby buildings should be sold soon to Transfer Company LLC, who want to renovate the building, add more space, and include townhomes on the site. Watch the video snippet above. If it doesn’t work for you, click here. On December 12, 2014 formal bids were opened to perform improvements to Market Plaza and Exchange Plaza; each plaza provides pedestrian access between Fayetteville and Wilmington streets. The project involves renovations and improvements to both plazas, which are in varying states of disrepair. Improvements include the installation of new concrete unit pavers, concrete paving, seat walls, planting, site lighting, storm water drainage, electrical service, water service, irrigation, screen enclosures, and shade structures. A total of four bids were received. The lowest bid was submitted by Holt Brothers Construction, LLC in the amount of $1,129,897. Funding is appropriated in the capital budget and will be transferred administratively. SDMWOB participation is 100%. Council members continuously made comments about how they didn’t know about this project but there have been images, plans, and public meetings about it for about a year now. We’ve discussed it on the blog already and it’s great to see this plaza project move to the next step. I am pretty sure that this project will then wipe out any last remnants of the previous Fayetteville Street Mall design that is still left from the 1970s. Go get a taste of it, if you want, before it’s gone. The Committee recommends upholding staff’s recommendation to select Transfer Company, LLC for the redevelopment of the Stone’s Warehouse site, authorizing Community Development to coordinate preparation of a purchase agreement, and authorizing staff to amend zoning application Z-25-14 to include split zoning, with conditions to accommodate the proposed uses as proposed by Transfer Company, LLC. The Committee’s recommendation was with the understanding that a majority of the proceeds from the disposition of the property would go toward development of affordable housing in this area and to assist with the Rex Senior Center relocation. After discussion on the future of the Rex Senior Center, it was directed that the item be placed on this agenda and that administration work with the parties involved to determine Transfer Company, LLC’s proposal for the Rex Senior Center. A memorandum from staff outlining the discussion is included with the agenda packet. Council can take action to proceed with the recommendation as outlined by the Budget and Economic Development Committee. The ongoing conversation here is how to move the Rex Senior Health Center but that didn’t stop council from approving the Budget and Economic Development Committee’s recommendation for city staff to start work on selling the property to Transfer Companny, LLC. Another council approval will be needed for the sale to take place. Just outside of downtown Raleigh is a site that’s getting a lot of attention lately. 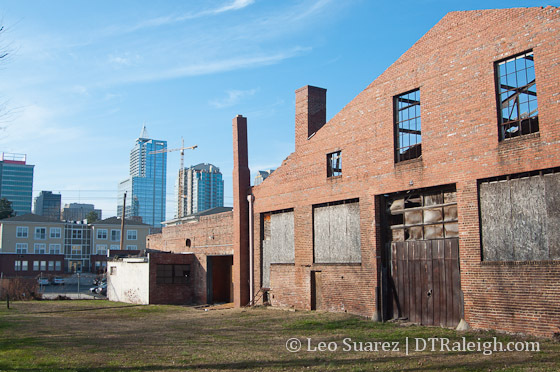 The block containing what is called Stone’s Warehouse at 500 East Davie Street could see a major renovation and new development in the near future. This city-owned property could be sold soon and transformed into a destination for a mix of uses. I wanted to introduce this project as well as dive into the current topic of affordable housing, a criteria the city has listed for potential developers of the site to comply with. An old bus repair shop, the warehouse has been around since about the mid-1920s. The Carolina Coach Garage and Shop outgrew the space and moved out in 1939. After a variety of uses, it was eventually acquired by the city in 2001 and has been empty since. In addition to the empty warehouse, the site also includes the currently open Rex Senior Health Center. The parking lot and some open land rounds out the rest of the site. The city has slowly acquired the majority of the block, not including a few houses on the southern end. They intend to use it for community development and have put the site up for sale to developers. A long list of criteria has been put together and today we have three developers in the running for the sale of the site based on their proposals. Transfer Company LLC plans for a grocery store, cafe, and a community hall with space for small food producers. They would build a 13,000 square foot building for additional food/drink space and a row of 16 market-rate townhomes. The proposal states that it would assist with the moving of the Rex Senior Health Center. AACRE plans for a five-story, 200-unit apartment building with 300-space parking deck. The renovated warehouse would have a grocery store in it and the health center would remain although in a smaller space. 10-20 apartments would qualify as affordable housing. Empire Properties plans for an “Entrepreneurs’ Village.” This would consist of the Exploris Charter School (currently looking for a home for their elementary school), a medical office, a museum, and an “intimate acoustic music hall” called The Garage. 49 apartments would be added with 15 qualifying for affordable housing. As of this writing, Raleigh city staff and the Budget and Economic Development (BED) Committee recommend that the proposal by Transfer Company LLC be selected for the site. 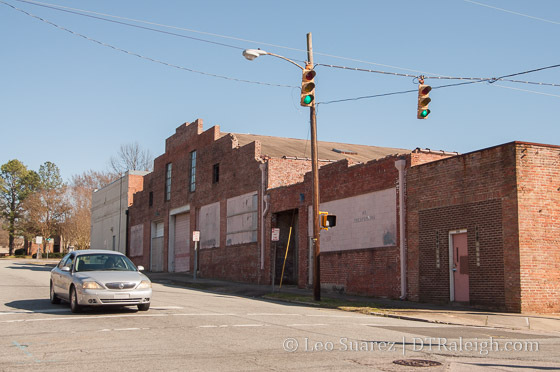 Raleigh weighs affordability, history as developers vie for Stone’s Warehouse via News & Observer. 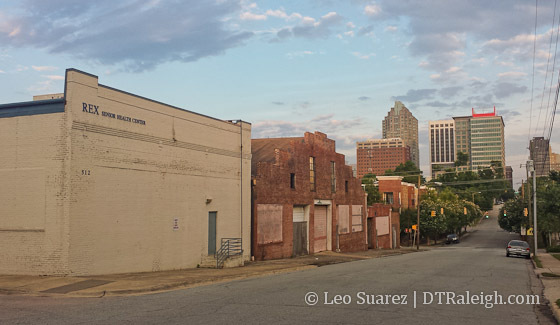 Stone’s Warehouse Redevelopment Moves Forward via Raleigh Public Record. 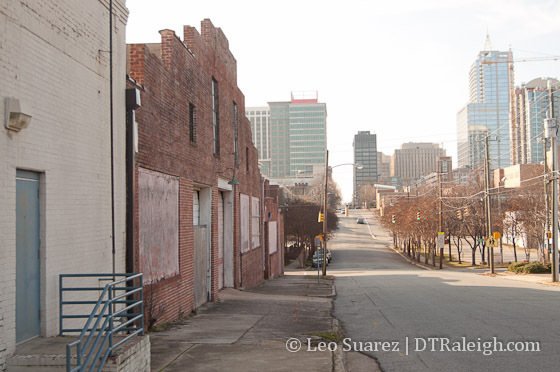 The most controversial and discussed topic with Stone’s Warehouse, and sometimes with downtown Raleigh in general, seems to be the affordable housing topic. Take note that the BED committee recommended a plan that does not include affordable housing. I think we first have to recognize that the term “affordable housing” means different things to various people. The first place I looked for a definition is our city’s adopted 2030 Comprehensive Plan which explains it nicely. The terms “affordable housing” and “workforce housing” mean different things to different people, and a variety of definitions have been advanced by various groups. For the purposes of this plan, housing is “affordable” if the cost of occupying it does not consume more than 30 percent of household income—the definition promulgated by the U.S. Department of Housing and Urban Development (HUD). HUD defines housing costs as contract rent plus utilities for renters, and monthly payment (mortgage plus taxes and insurance) for owners. Affordable housing refers to housing affordable to households with incomes at or below 80 percent of the HUD-estimated Area Median Income (AMI) for owners, and 60 percent for renters. Workforce housing is generally thought of as housing affordable to essential public- and service-sector employees such as teachers, fire fighters and nurses. It is defined here as housing affordable to households with incomes up to 120 percent of AMI. As of February 2012, the HUD-determined AMI for a family of four in Raleigh is $79,900. Affordable Housing – Typically using government subsidies to reduce the price of the home below market rates so that individuals/familes earning 80% less of the AMI can own, 60% less can rent. Housing that is affordable – Market rate homes that do “not consume more than 30 percent of household income” according to the 2030 comprehensive plan. Both may or may not be related. The housing section of the 2030 Comprehensive Plan has a lot more on this and should be your next stop for more information. Now that we’ve defined affordable housing, what about policies that help guide where affordable housing should be placed in the city? The City of Raleigh’s Scattered Site Policy was created to help guide this. It identifies high and low priority areas where affordable housing is needed. It is a guide in order to avoid clustering too much affordable housing in one area. As recently as early 2014, the policy was under review. The Raleigh Public Record has a write up, including a map, about the conversations that took place. Areas of the city are broken up into four priorities: Priority One being areas are those that lack affordable housing; Priority Four areas have heavy concentrations of low-income and minority residents. *NOTE: As of this writing, the page on the city’s website for the policy has been taken down and I can’t find the policy listed. The Scattered Site Policy is mentioned several times in the 2030 Comprehensive Plan. Updates to it should certainly be looked at but following it is a strong recommendation of the plan. 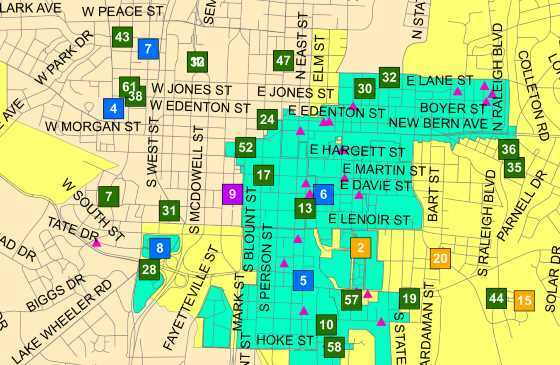 When it comes to the locations of affordable housing in Raleigh, there is some data available showing the mapped locations. I’ve had a list of sites in Raleigh which include Raleigh Housing Authority developments, HUD subsidized projects, and NC Housing Finance Agency projects. I went ahead and mapped them which you can see below. NOTE: Data is dated December 2013. City-owned rentals are not included in this map. Some projects may also be paid off and are no longer considered affordable. 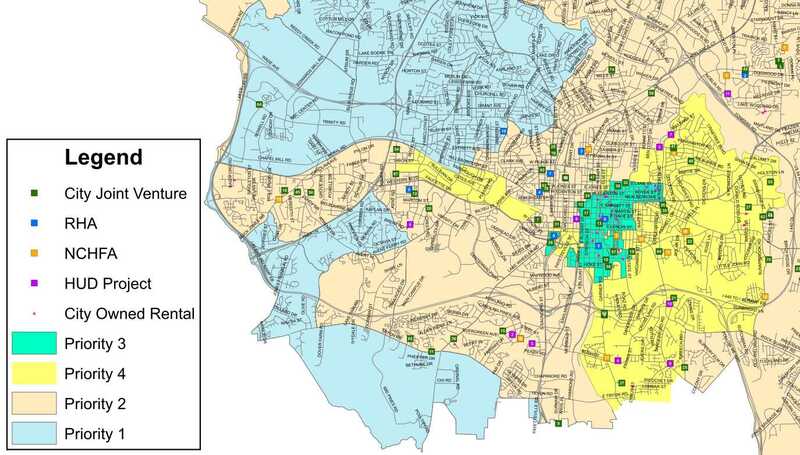 Another map to show is this one below, showing subsidized affordable rentals on top of the scattered site policy. This map is dated December 2013 and shows the entire city. For finer viewing, I recommend downloading the pdf. Click for larger. Download the pdf for even larger. So with all this presented, here is the controversy. The adopted Scattered Site Policy is not being followed. The maps show a higher concentration of affordable housing projects in the low priority areas and very few units in high priority areas. For Raleigh to be a diverse city with as much equal access across a variety of socioeconomic lines, a quality of a true 21st-century city by the way, communities of mixed-income must exist. Adding market rate housing to an area of low-income is not something that should be avoided especially when it isn’t displacing anyone. Adding affordable housing to an area where there is little or none (priority 1) should be the bigger priority and real controversy. How can Raleigh find the discipline to push against the trend as the city council approves again and again more affordable housing in priority 3 and 4 areas of Raleigh? Let’s swing back to Stone’s Warehouse. There’s a strong argument for the need for more housing that is affordable in our city. The comprehensive plan proves the demand and how the amount of residents burdened by housing costs has been rising over the last few decades. However, demanding that affordable housing be included with all projects at the expense of nearby incomes is short-sighted. To create truly mixed-use, mixed-income communities Raleigh should place higher priority on delivering services, amenities that don’t exist. That’s not a blanket statement, sure, but let me paraphrase a woman I heard at a South Central CAC meeting that stood up and kindly commented about the Stone’s Warehouse presentation. More housing? I feel like we’ve got plenty of housing. We need retail and economic development in our neighborhood. Stone’s Warehouse is in the middle of a sea of affordable housing projects. It’s also in the middle of a food desert. With a potential grocery store at the site, it’s possible nearby residents would benefit from access to healthy food, a close location, and possibly a nearby job. With the warehouse being saved, the project should draw huge respect from the neighborhood for the efforts to save the history. Economic development could bring an even more impactful benefit compared to affordable housing at Stone’s Warehouse. Let’s not let a hot, politically-charged topic sway the real need in this location.